The city of Kasauli is a time wrapped city reminding the colonial architectural set up of splendid facades, cobbled paths and quaint shops. It is situated 77 Km away from Simla and established by British Raj. Travel to Kasauli will bring you near to the natural beauty of pine and alpine trees wrapped with serene white snow. 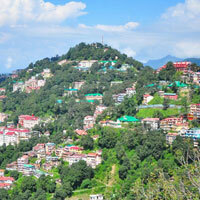 The famous Tourist Spots in Kasauli comprises of Monkey Point, Sanawar, Dharampur, Sabathu etc. The Kasauli Tour packages offered by the company are dealt with professional acumen. The highest point in Kasauli is the Monkey Point which is just 4-km from the Kasauli bus stand. There is a small temple here which is dedicated to Lord Hanuman. It is believed that when Lord Hanuman was returning with Sanjivany Booty or the Magical Herb, his foot touched the hill leaving his foot print. Situated 6-km from Kasauli, Sanawar houses is one of the best schools in the country. The Lawrence School is known to be one hundred-years-old and is a major attraction of the town. Dharampur is situated just 15-km from Kasauli on the National Highway No.22. Surrounded by healthy air of the fragrant pines, Dharampur has one of the best hospitals in India for curing of tuberculosis. It is a little cantonment town that has a Gurkha fort built in the early years of the 19th century. It is yet another cantonment at town at an altitude of 1,925m. This place is can be reached by a link road.